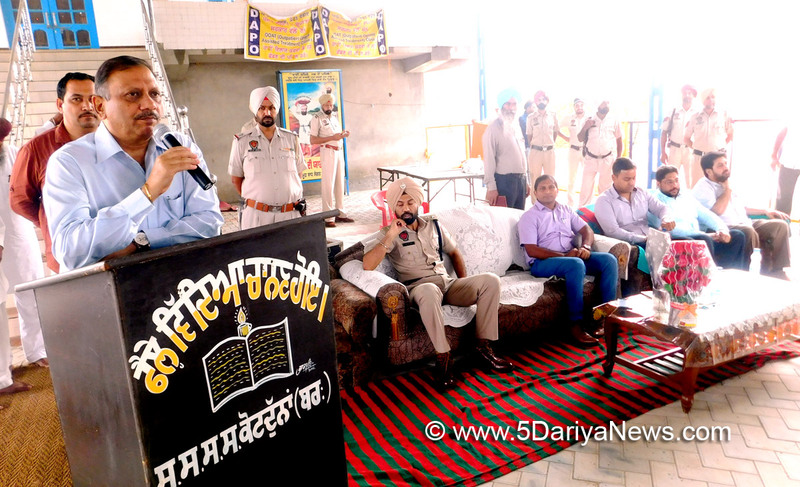 To make common people aware of ill-effects of drugs under Drug Abuse Prevention Officer (DAPO) programme, Barnala district administration organized an awareness program at several villages. Deputy Commissioner Barnala Dharam Pal Gupta along with Senior Superintendent of Police (SSP) Mr. Harjit Singh and other administrative officials visited Kot Duna, Pandher and Aspal Kalan villages and urged the villagers to unite against the use and transit of drugs.DC Dharam Pal Gupta said that the district administration, following the directions of Punjab Government, initiated a special drive on village level to sensitize common people about the ill effects of drugs. He added that under the drive, they have planned to cover all the villages of the district and main motive of the drive was to educate and alert the commoners against drugs and motivate them to supply the information of drug addicts and drug peddlers to administration for adequate action plan. Mr. Gupta said that for the proper treatment of a drug addict, the family members and friend circle of the victim should cooperate with him as the victim needs special care to get rid of drugs after being addict to it. He added that the state government has also been providing free of cost treatment to drug addicts.Meanwhile, SSP Mr. Harjit Singh also motivated common people to stay away from drugs and said that it is only an illusion that drugs enhance stamina or capacity. He added that once one start taking drugs with this illusion, he only become addict of it. He assured the villagers that drug addict or his family will not be harassed in any case, if he wants to get himself treated from the drug addiction.On this occasion, ADC Sandeep Kumar, Assistant Commissioner Dr. Himanshu Gupta, Assistant Commissioner (UT) Pavitar Singh, DDPO Sanjeev Kumar, Assistant Director Youth Services department Vijay Bhaskar, BDPO Neeru Garg, SHO Dhanaula Naib Singh and various others were also present.